As dozens of supporters massed outside its London embassy, Ecuadorian officials late Friday denied reports that they had been planning to unilaterally revoke the asylum first granted to Wikileaks founder Julian Assange in 2012, expelling the controversial journalist from their London embassy and handing him over to British police for arrest on charges that he skipped out on his bail – which would have likely set in motion a chain of events ending with Assange’s extradition to the US. Bloomberg reports that Ecuador denied it had been planning to oust Assange, as Wikileaks initially reported earlier this week, though some are skeptical, believing instead that the Ecuadorian backed down under pressure from the UN. Of note, is the fact that Ecuador’s foreign minister tweeted about mechanisms for revoking Assange’s asylum. However, reports about his impending expulsion drew the scrutiny of UN human rights officials. All of which seems to suggest that the public pressure brought to bear by Assange’s organization and its supporters prompted Ecuadorian President Lenin Moreno to back down. Why do you suppose the Foreign Minister of Ecuador would choose today of all days to start tweeting about mechanisms for unilaterally revoking asylum claims? El asilo diplomático es una facultad soberana de un Estado, que tiene el derecho de otorgarlo o retirarlo unilateralmente cuando lo considere justificado. Assange and Wikileaks have been feuding with Ecuador since the embassy briefly revoked some of his privileges,including Internet access, last year, claiming that he was in violation of certain protocols, including his refusal to maintain a clean living space, poor hygiene habits and his refusal to clean up after a pet cat. Though Assange’s privileges were eventually restored, he and his legal team sued the Ecuadorian government, and since then, the tensions have only escalated. Recently, Ecuadorian President Lenin Moreno, who has described Assange as a “stone in my shoe”, accused Wikileaks of publishing private photos of his family. The organization also recently published allegations that Moreno enriched himself from an offshore account in Panama — allegations which Moreno has vehemently denied. 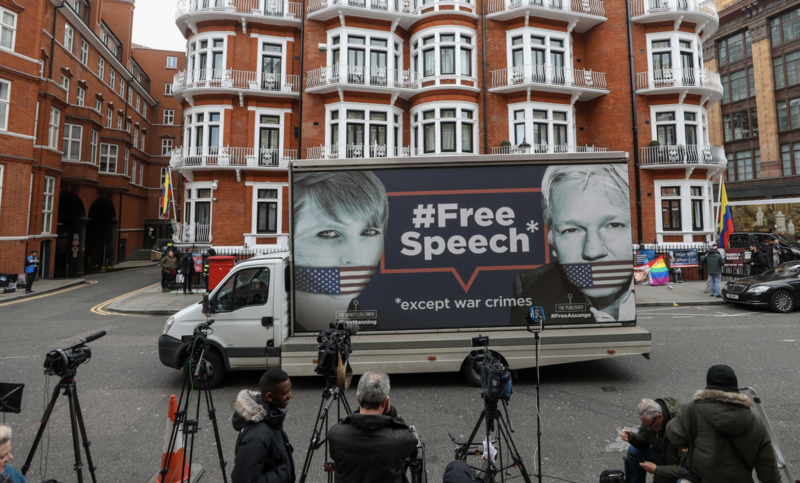 However, journalist Cassandra Fairbanks, who traveled to London to keep vigil outside the embassy, and who recently visited with Assange inside, tweeted that the government’s claims shouldn’t be trusted. I spoke to one of his lawyers who told me that they have no idea if those claims can be trusted. Ecuadorian Government is claiming they are not expelling Assange and they have no intention of turning him over. Whats up with that? Is it fake news? Fairbanks also tweeted video of the protesters gathering outside the embassy in support of Assange. As mentioned above, the UN Special Rapporteur on torture Nils Melzer demanded Ecuador allow Assange to remain in its embassy, arguing that should he be expelled, he could face “violations of his human rights” and possibly even torture, as journalist Sara Carter pointed out.